Who should participate in the Lord's Supper? How frequently should we observe it? What does this meal mean? What happens when we eat the bread and drink from the cup? What do Christians disagree about and what do they hold in common? These and other questions are explored in this thought-provoking book. This new volume in the Counterpoints: Church Life series allows four contributors to make a case for the following views: * Baptist view (memorialism) * Reformed view (spiritual presence) * Lutheran view (consubstantiation) * Roman Catholic view (transubstantiation) All contributors use Scripture to present their views, and each responds to the others' essays. This book helps readers arrive at their own conclusions. It includes resources such as a listing of statements on the Lord's Supper from creeds and confessions, quotations from noted Christians, a resource listing of books on the Lord's Supper, and discussion questions for each chapter to facilitate small group and classroom use. 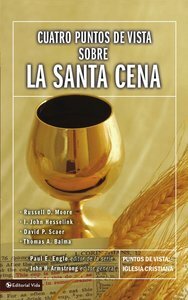 About "Cuatro Puntos De Vista Sobre La Santa Cena (Understanding Four Views On The Lord's Supper)"
John H. Armstrong (D.Min., Luther Rice Seminary) is president of ACT 3 in Carol Stream, Illinois and served as a pastor for more than twenty years. He is an adjunct professor of evangelism at Wheaton College Graduate School. His online commentaries regularly appear at www.Act3online.com. He holds degrees from Wheaton College, Wheaton Graduate School, and Luther Rice Seminary. He is the author or editor of a number of books including The Catholic Mystery; Five Great Evangelists; Understanding Four Views on the Lords Supper; Understanding For Views on Baptism; and most recently Your Church Is Too Small: Why Unity in Christ's Mission Is Vital to the Future of the Church.